What you're looking at is an FNH SCAR rifle with an CAR-5 tactical stock (most commonly seen on M4-style rifles), an M203 grenade launcher, a Leupold Mark 4 CQ/T "circle-dot" scope, and an HK36 barrel...with a soda can silencer. 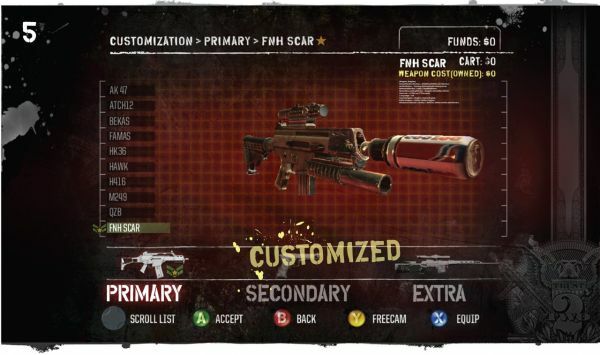 This is the kind of customization that Army of Two: The 40th Day will allow players to tinker with. You can literally attached any part of any other gun to your creation. Attachments range from the common to the rare to the outlandish -- and every attachment has an impact on your gun's performance. 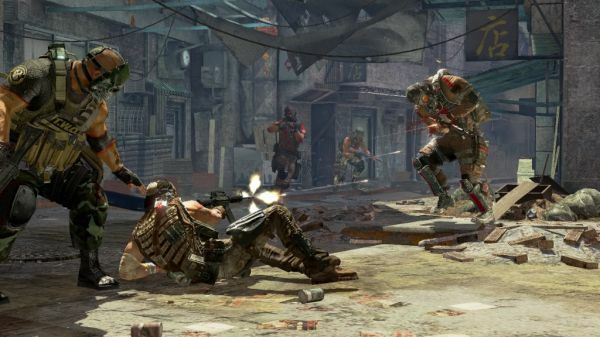 Spenser Norrish, Community Coordinator for EA Vancouver's Army of Two team and one of the pre-PAX community event's frontrunners, posted a blog entry last month teasing some of the game's custom gun possibilities. The entry features two images that show off two rifles being outfitted, and sharp readers will catch the partial -- and impressive -- list of available assault rifles on the left side of the customization menu. "Don't drop that gun! I just spent two hours customizing it!" Kotaku got their hands on the builder (dubbed "LEGO with guns" by the dev team), but not before Jason and I were given an exclusive peek by producer Matt Turner. While neither preview articles went into great detail at the time, I can assure you that the level at which you can customize your weapons is so high that you will probably never try every combination. It's almost overkill. And it's pretty awesome. Beyond just the attachment system are the "skins", of which over 20 are planned. Guns are definitely stealing the spotlight this time around, at least for trigger-happy guntards like myself. Check out the Army of Two blog for more images.